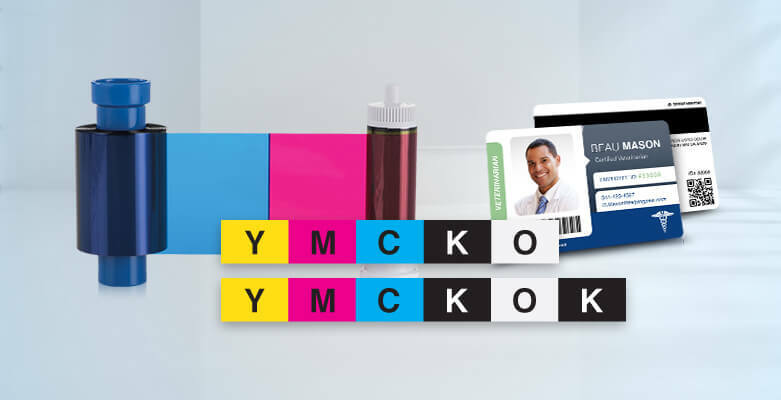 AlphaCard Blog - Choosing between YMCKO and YMCKOK ribbons – do you know which one you need? Printer ribbon names can look confusing – YMCKO 300 print may sound strange, but it just tells you what color panels are on the ribbon and how many prints you can get! The biggest factor in choosing a printer ribbon is actually your card design. Full color printer ribbons have Yellow, Magenta, Cyan, and blacK panels on them – using these colored panels your ID card printer can create a wide range of colors and designs. That represents the YMCK part of the name. Then most ribbons will have an Overlay panel (sometimes called a Topcoat panel instead). This clear layer is applied over your design to provide some protection to the card. So with a YMCKO ribbon, you have a full-color ribbon with yellow, magenta, cyan, black, and overlay panels. This ribbon prints full color with an overlay on ONE side of a card. If you are printing single-sided cards, you would get 300 full color cards from this YMCKO ribbon. If you want dual-sided cards with full color on both sides, you’ll get half the yield (150 cards) because you are using a full set of YMCKO panels for each side of the card. So what if you want dual-sided cards, but don’t need full color printing on both sides? That’s when you would use a YMCKOK ribbon! This ribbon has the full YMCKO set of panels for the front of the card, then an extra black (K) panel for the back of the card. ID card printers come in many other styles – YMCK ribbons that don’t include an overlay for use with reverse transfer and laminating printers, monochrome ribbons that are only one color, ribbons with fluorescent panels, and more! You should always use the printer ribbon recommended by the manufacturer for your printer, like using Magicard ribbons for your Magicard printers. By Keisha|2019-03-22T16:21:09+00:00March 12th, 2019|Ribbons|Comments Off on Choosing between YMCKO and YMCKOK ribbons – do you know which one you need?